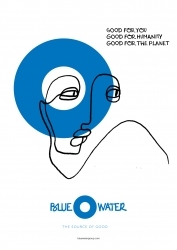 Stockholm, Sweden, October 13, 2017 –(PR.com)– Bluewater, a world leader in innovative, market-leading technologies delivering contaminant-free drinking water, today announced a strategic push to fast-track wider public access to purified drinking water and disrupt the global beverage’s industry reliance on single-use plastic bottles. Bengt Rittri, the Swedish environmental entrepreneur who founded the Stockholm-based company, said Bluewater is committing to reimagining point-of-use water delivery for homeowners and businesses alike. “We want to harness human ingenuity to develop disruptive transformational thinking that will provide more people around the globe with on demand clean drinking water in ways that will help bring an end to the need for throwaway plastic bottles,” said Rittri. He added that the health of the planet demands imaginative thinking to halt the vast tide of plastic waste that sees over one million plastic bottles being sold every minute and less than nine percent recycled. Speaking prior to the opening Wednesday, October 11, in Alicante, Spain, of the 2017 -2018 Volvo Ocean Race, Rittri made an emotional appeal to everyone on the planet to join him in a movement to change the existing water distribution and consumption model that sees billions of plastic bottles being shipped from one side of the world to another. Noting that many of those bottles will end up in the oceans as litter, Mr. Rittri said Bluewater has both the technology and developed business models that can spell end the need for single-use plastic bottles. “I believe Bluewater offers a very viable solution because water generated at source stops the need for long-distance transportation. Bluewater’s point-of-use water generation technology already leverages patented second-generation reverse osmosis solutions to deliver unmatched amounts of pure water and slash the amount of waste water by up to 80 percent compared to traditional RO systems,” Rittri said. To help draw attention to Bluewater’s unique technology the company has partnered with Volvo Ocean Race entry Vestas 11th Hour Racing, which aims to be the most sustainable competitor in the nine-month long round-the-world event. Bluewater water purifiers will be generating pure drinking water in the team and guest pavilion at each of the 10 stopovers. “Supporting Vestas 11th Hour Racing is driving many new insights and presents an opportunity for us to scale up our communication about the solutions available and share our learnings so that they are not kept just within Bluewater,” Bengt Rittri said. The first leg of the Volvo Ocean Race starts on October 22 from Alicante, Spain. The yachts will have stop-overs in 10 ports, including Cape Town, Hong Kong, Melbourne, Auckland, Itajaí, Newport, Rhode Island, Cardiff, Gothenburg and The Hague. During the 2017 American’s Cup races on Bermuda, Bluewater supplied the 100-strong Swedish Artemis team and support staff with a rainwater harvesting system that met their daily needs for drinking water. During the four weeks of the America’s Cup finals, Bluewater public water stations saved the equivalent of some 250,000 plastic water bottles from being used.